WELCOME TO MY MONEY MISSION ONLINE: SUPER SENSATIONAL SHOUT-OUT SATURDAY AND SO MUCH MORE!! SUPER SENSATIONAL SHOUT-OUT SATURDAY AND SO MUCH MORE!! Today is my weekly Super Sensational Shout-Out, where I feature one or two blogs that I have stumbled upon during the week and really enjoyed. But, before I post those, I just have to tell you that SOMEONE HAS A BLOGGY CRUSH ON ME! Yep, Frances, over at Looking For Deals has me listed on her Bloggy Crush List. I didn't even know that such a list existed!! Woo-Hoo...I was sooooo excited!! This award is great fun, as I get to now list those that I have a bloggy crush on! I have some Bloggy Crushes of my own! Bloggy Crushes, almost every blogger has them. If you can't log on to check your own blog, without checking certain other blogs for updates... If you feel a wave of sadness upon finding that they have posted nothing new recently... If you find yourself repeating their posts to other folks, who have no clue what the heck a "blog" even is, you have a bloggy crush! There are more, but I think 11 is enough for now! A.Marie, I am so glad you are feeling better!! I'm going to check out some of your bloggy crushes. They may become mine as well. Hey, thanks! I've never seen that one before! How awesome! Hi Ace! 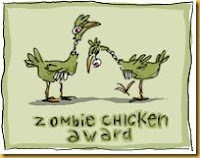 I was too late to let you know that I gave you this award; I'll stop by and visit your blog and tell you anyway! And, Frances, you ARE interesting, my i-have-a-bloggy-crush-on-you and you-have-a-bloggy-crush-on-me bloggy friend!! LOL!! I have a crush on your blog too! I am happy dancing with you, A.Marie. And I was only kidding about the pouting. I found some great blogs through your list, so was happy to see it. A. Marie ~ You are such a sweetie! 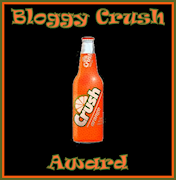 Thanks for the bloggy crush award. How cool and what an honour to get it from you! It was my first : ). Hope you have a great weekend! Sorry for the limited commenting lately, but I have been reading! I am glad you are feeling better, and you made me blush. I have a bloggy crush on yours too. I love reading your blogs.